a more central position which embraces, and even advocates, a bigger role for government, both in terms of its fiscal position and its interventions in the economy, whether that be by building, owning and running airports or regulating product and labour markets. She says that the government is actually seeking to own Labor’s modern signature policies – Gonski, the National Disability Insurance Scheme and Medicare. If you go back further, we had Menzies intervening and taking over the funding of universities, and then science blocks in secondary schools. Then from Whitlam onwards we had Labor funding schools generally, including private schools, free trade, privatising the Commonwealth Bank and other government enterprises, floating the dollar, Medicare, enterprise bargaining, competition policy, the national curriculum and testing, climate change, NDIS and Gonski. Along the way there was health, pharmaceuticals, hospitals and TAFE. From the other side I’m struggling to think about anything other than the GST. 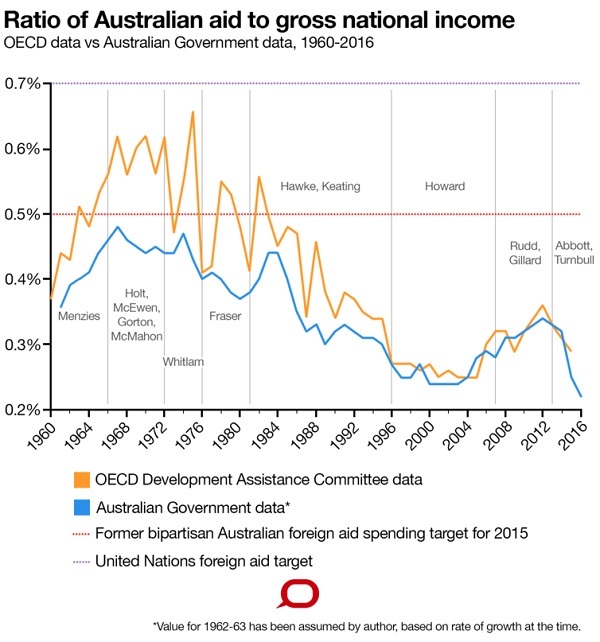 Of course, social initiatives taken by the Whitlam government still colour our world. I’m not denying the influence of the Howard government on how we live out lives, but it seems most of the big overt changes have been made by Labor. It’s good to have bipartisanship on major policies, but many pundits, Laura Tingle among them, are now asking where Labor can go to differentiate itself. Crikey published a fake budget reply speech, where Shorten accuses Turnbull of infringing Labor copyright. 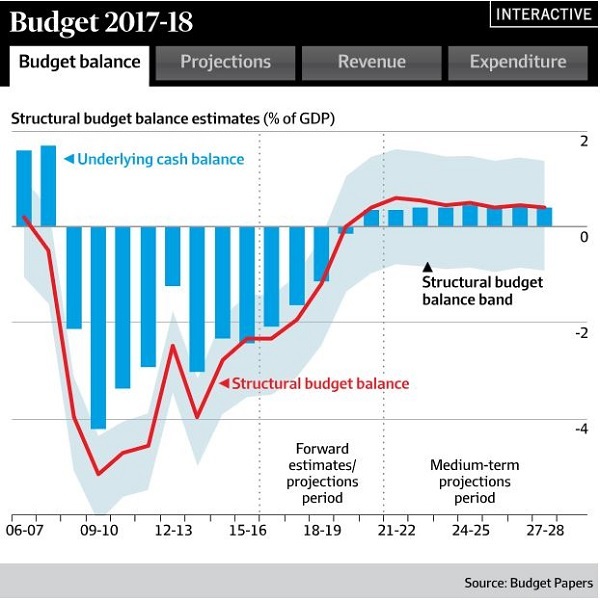 Shorten’s budget reply speech (pay-walled – Google ‘Bill Shorten budget reply speech 2017’) has no difficulty in differentiating Labor in two main ways. Firstly, on fairness. Labor wants to pay for the Medicare levy increase by limiting the government proposal to increase the Medicare levy of 0.5% to those earning over $87,000 pa rather than charge all taxpayers over about $21,000. Combined with this they want to retain the 2 per cent deficit levy on those earning over $180,000 while the deficit exists. Fairness to Labor is for those who have to help those in need. For the LNP it is to charge everyone equally according to what they earn. Essential poll finds voters prefer the Labor way on this one 56 to 27%. Shorten identifies other ways the budget Labor would be more fair – protecting penalty rates instead of cutting them, funding schools properly, investing in universities rather than ripping money off them and jacking up fees, implementing negative gearing changes and capital gains changes rather than protecting property investors, protecting workers in labour-hire firms from exploitation, not cutting $500 million from Indigenous services, investing in TAFE rather than cutting courses and closing campuses, and doing something about climate change. The scale of India and China is not like anything we’ve ever seen – to win, it’s about being clever. I think he’s right. With a population less than that of Texas, there is no reason we can’t all have jobs and live well in the modern world if we are clever and smart. Yet the LNP government is still ripping money out of universities, confiscating a large slice of the profits they’ve made on teaching, where those very same profits are what they now depend upon to run their administration, to build lecture halls and other capital stock and to enhance research. Nearly half of us think university education should be free, and 56% disapproving of university funding cuts compared to 28% in favour. On schooling, the government’s acceptance of Gonski needs-based funding was a brilliant breakthrough, but only an additional $1.7 billion was provided in the four-year forward estimates. The Greens were initially inclined to wave the government plan through to confirm needs-based funding, applauding the bravery of upsetting schools that were overfunded, including influential Catholics. Now they are inclined to reject the deal because it is simply too mean on funding. They’ll reserve their position until a senate inquiry has done its work. Labor has promised to restore their full projected Gonski funding, but one hopes they would also get brave about overfunded schools. Shorten said that the LNP had cut $2.8 billion out of training, and Australia has lost over 130,000 apprentices on their watch, followed by a further cut of $600 million in this budget. I know that there is extra money to come out of 457 visa changes with charges made on companies hiring overseas labour, but to me this seems the unkindest cut of all, totally neglected by the media. Can you imagine it happening in Germany, or any grown-up country, let alone one that has a mining downturn and has lost its car industry? Spending, including infrastructure is weighted to the out-years, even beyond the normal four-year projections. Revenue improvement depends on heroic assumptions – $44 billion from income tax bracket creep from higher wages, when wages have actually been falling, more than 40% increase in company tax even though company tax cuts are assumed, an increase of 60% in capital gains tax receipts by 2021. Again, $44 billion of budget repair depends on that orange line being correct. Ken Henry, former treasury secretary and now chairman of NAB, apart from asking some genuinely penetrating questions about the bank tax, called the forward projections dishonest and Pythonesque. He said it was like saying you could walk from Sydney to Melbourne in an hour, and then saying after 55 minutes, Well it will only take another hour. In 1984-85, the deficit was 2.6 per cent of GDP, net debt was 9.3 per cent of GDP, receipts were 25 per cent of GDP and payments were at a historical high of 27.6 per cent of GDP, he said. By 1989-90, the budget surplus was equal to 1.5 per cent of GDP, net debt was 4 per cent of GDP, receipts had actually fallen to 24.4 per cent. 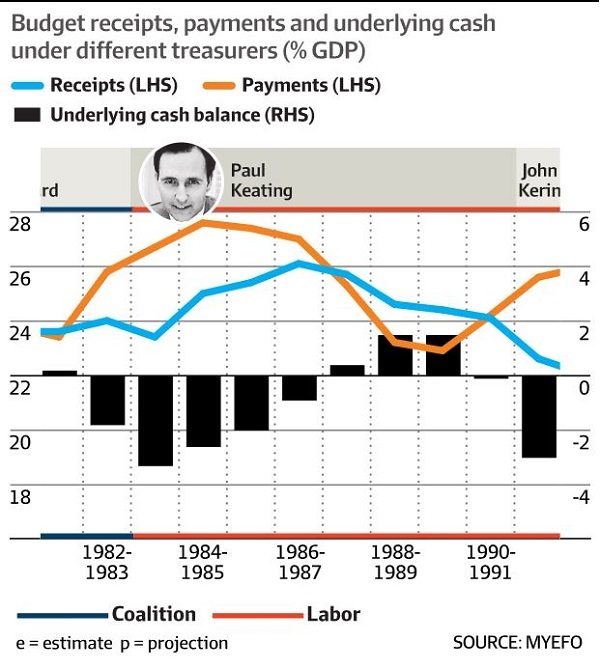 Keating got it down by cutting spending by 3 per cent each year. Howard did OK then fell into a hole. Keating started in Howard’s hole then did OK until John Kerin fell into a hole with the 1991 recession. 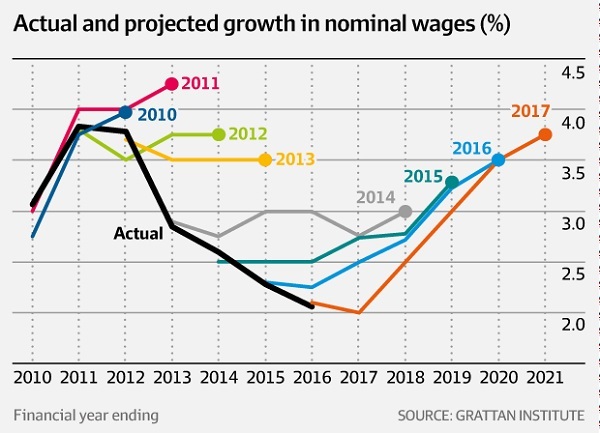 Swan started in the GFC hole, but then improved steadily, though not as quickly as he’d hoped, until poll-axed by reality in 2013. 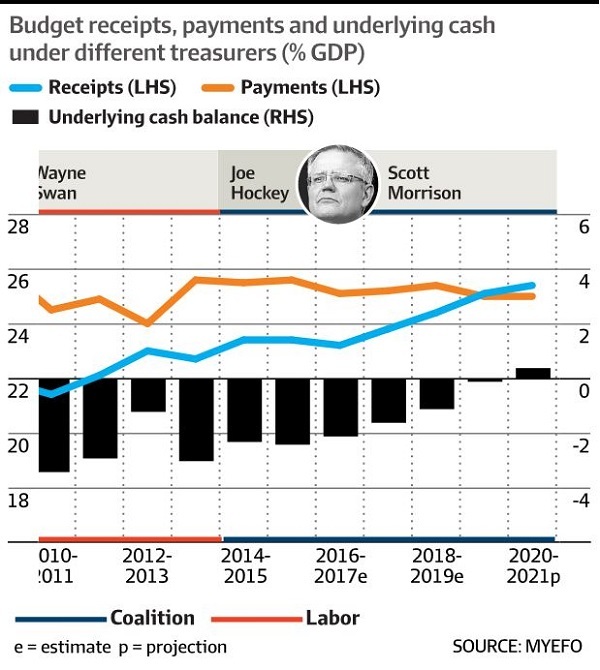 Gains have been exceedingly minor under Hockey and ScoMo in their completed work, but things will now improve if we believe their assumptions. I think no-one does, not even the authors. Henry says we’d need 10 years of surpluses at 2-3% of GDP to meet the stated goal. That top blue line looks like a 20% increase over eight years, which is not too alarming, if it can be believed. Yet the image in the article is under a heading Debt is still debt and Henry on the 7.30 Report worries about risk. He says we are in no position to handle an external threat like the GFC. 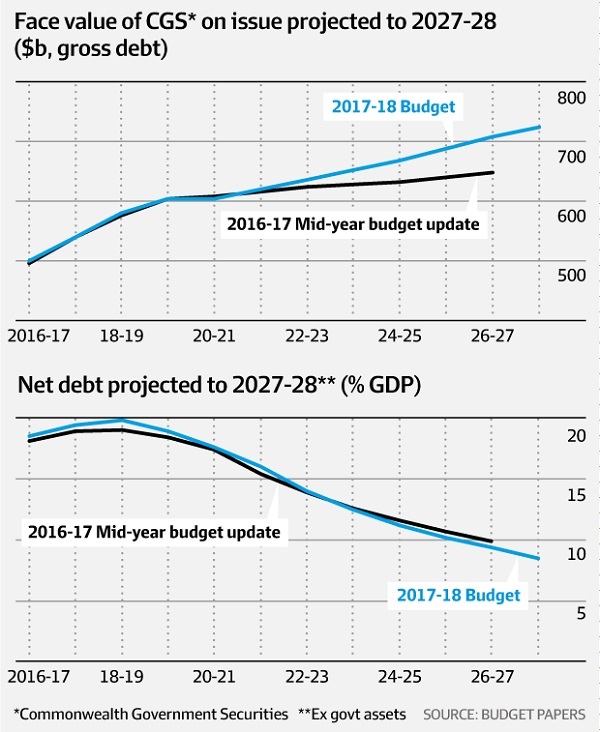 There are other noteworthy elements of the budget, such as drug testing job seekers (we need full employment, not victim blaming), and the 6% yearly increase in defence spending to reach 2% of GDP by 2020-21. Laura Tingle told Kim Williams in an ABC RN program well worth the listening how the discourse of parliament and the media had descended into pointless shouting. Keating, for all his quoted histrionics, worked patiently over time to educate us about what we needed to know. In this case the ‘wisdom’ runs the other way. Turnbull and ScoMo paid big bucks to JWS Research to find out what they needed to do to please the populous. According to Essential Report on Budget measures and other pollsters, individual budget measures largely hit the mark. Yet two-party voting is for now stuck at 53-47 or 54-46 to Labor across four polls. Cory Bernadi believes that with this budget the Coalition is now officially a principle-free zone. Laura Tingle sees Turnbull as a problem-solver, essentially a transactional politician. I think that is about right. In this budget the problem was, according to Dennis Shanahan, how to lift the Coalition in the polls. So far it hasn’t worked. John Howard once said that the Labor Party representing the workers could not legitimately represent the whole Australian community. I’m sure Turnbull and company think the same. Until the political warriors respect each other, I think we’ll not have reasoned political discourse. Which is why, as Tingle points out, politicians and journalists are held in about the same esteem as used-car salesmen and prostitutes. Peter Lewis, who I believe runs Essential Report, says that Turnbull didn’t get a bounce because he chose to play on Labor’s turf. The budget provides a $4.8b subsidy for the advertising we all hate. Advertising that works by making us all feel discontented. One of the early 20th century pioneers of marketing psychology was Edward Bernays, a nephew and keen student of Sigmund Freud. In his book, entitled Propaganda, he wrote approvingly of the role of advertising in manipulating public opinion to drive consumption as a mechanism for keeping a population ‘more docile and less subversive’, more easily governable. 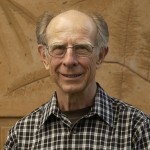 More recently, former ad executive Greg Foyster described the result of advertising as a “culture of discontent”. Me, I would like to get scle advertising back a long way. Problem is our economic system would collapse without advertising driving us to buy things we would dismiss as crap without advertising. That’s an interesting one, John, from Tim Hollo who used to work for Christine Milne. I’d never thought of advertising’s cost to the budget as a deductible business expense. I’m not exposed to it all that much, because I don’t watch much commercial TV. Of course I see it in newspapers, and have never used an ad blocker on the net. I’m amazed at how ridiculous it has become at times, and have always been amazed at why we still have women’s bodies being used in the way they are. It’s social and economic role certainly needs to be thought about. Tim strays into ‘brands’ which I think has other issues associated with it. We depend on brands quite a lot, and it’s not all bad. Despite claims by some Australia does not have the highest marginal tax rate in the world. For example, ours is 50% vs 60% in Sweden. This is even less so when we take into account payments to super. John, I think the bottom line is that if we want substantially lower personal tax rates we need a higher GST. No pollie seems to want to face up to this unpalatable fact.